If you're looking for gold and silver pawn shops in Las Vegas, you'll find there are many options. Whether you need to find a buyer for your jewelry, get a great deal on vintage items, or simply want to check out the famous setting for a popular reality show, Las Vegas is the place to be. Do Pawn Shops Buy Purses? Gold and Silver Pawn Shop, the setting of a hit reality show, "Pawn Stars," has brought increased attention to the pawn industry in Las Vegas. In addition to a constantly changing selection of valuable vintage items and contemporary jewelry, Gold and Silver Pawn Shop has its own line of goods inspired by the show. Customers praise the store's high-end items, which may not be typical of other pawn shops in the area. Pawn Plus is another Las Vegas shop specializing in pawn loans and gold and silver jewelry. You'll find vintage and contemporary jewelry in the store's showroom. Customers report that deals are quite good, the prices offered for jewelry are fair, and that Pawn Plus has a helpful and friendly staff. This store is particularly interested in buying and selling all-gold jewelry, and many clients shop here for good deals on gold chains, rings, and other pieces. SuperPawn, a national chain with dozens of locations in the Southwest, has several shops in Las Vegas. SuperPawn specializes in designer and high-end jewelry, including sterling silver, gold, and diamonds. The shop has a layaway program to allow customers to buy jewelry in installments, and the National Jewelry Liquidation Center is a Las Vegas-based clearinghouse for jewelry from all SuperPawn locations. Customers praise the staff for their jewelry knowledge. Max Pawn and Jewelry is a Las Vegas pawn shop with a heavy focus on gold and silver jewelry. This store also specializes in diamonds and gems. Customers praise the friendly staff and clean, bright atmosphere of the store. 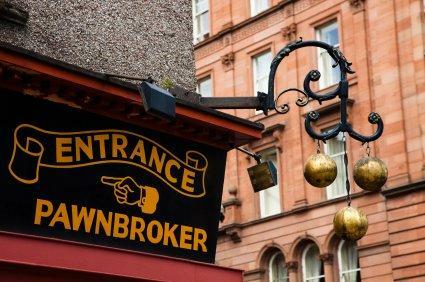 They also report that Max Pawn and Jewelry offers very fair rates for gold and sells merchandise at competitive prices. Many products are featured on the store website. Cash for Gold isn't strictly a pawn shop, but this is reportedly one of the best places to sell gold or silver jewelry in the Las Vegas area. Rather than reselling the merchandise, this store specializes in buying scrap jewelry and silverware for the value of the metal itself. If you're hoping to sell your old jewelry and are not interested in buying pawned merchandise, you might consider this option. If you're looking for a good deal on pawned jewelry in Las Vegas, you might consider visiting the shops early in the evening or around the holidays. These are times when you may find the best selection. Before you go to the gold and silver pawn shops in Las Vegas, make sure you have some ideas of what you'd like to find and how much these items are worth. That way, you're likely to get the very best deal.